I’m going to cover something I don’t usually see my little sister wearing, but let’s see if I can change that: a red lip. Wait, don’t run. Stay. Breathe. There are several ways of doing a bold lip (red or fuchsia, or orange or blue or whatever bright colour to your lip’s content). The one that I’m a big fan of and I think is the easiest (and the coolest) to wear is actually on trend right now (making it a great opportunity to find these little suckers without having to search only on professional stores): the matte lip. You should grab onto these lipsticks while the trend lasts, because, in my book, it’s a staple – I don’t care what fashion says. And you can always give it some shine with a lipgloss. Ah yes… Matte, velvety, voluptuous, edgy, and, if you choose wisely, super long lasting. 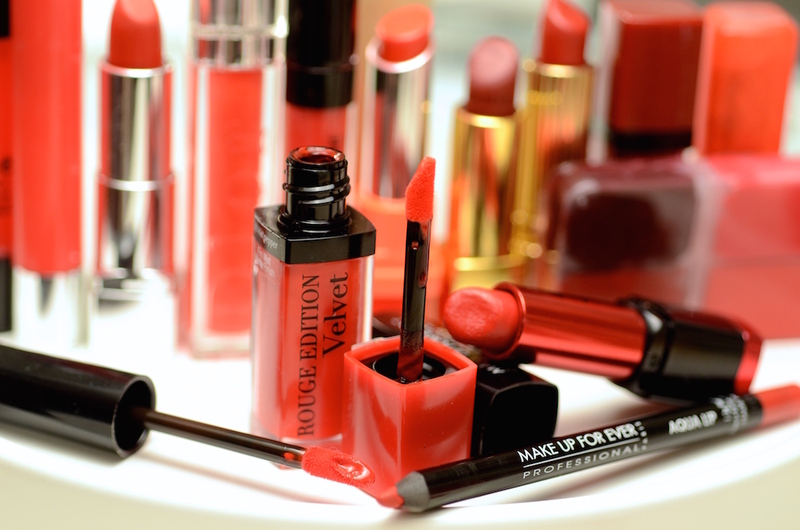 Among all the matte lipsticks, the easiest and coolest is, for me, the Bourjois Rouge Edition Velvet. It has a doe foot applicator and a creamy texture that does the job for you. No lip liners, no lip brushes, no fuss, no reapplications, and… no dry lips at the end of the day. This baby is super comfortable and yet it holds for a whole evening without having to reapply, even after eating and smooching. Once it sets, it creates a supple-looking stain that will not budge until you attack it with a cotton pad drenched in makeup remover (or olive oil). But since it gives you a little room to play, you can mix and match shades to your liking. I sometimes mix Hot Pepper or Ole Flamingo with Grand Cru to tone down the brightness. This is history, this is glamour. It’s the full-on red lippy with all those amazing steps that take you a while in front of the mirror, but it can make you remember where all that fascination over makeup was born… Applying a good old red lipstick the good old fashion way is just a must. You owe that pamper to yourself. Again, start with steady hands and a comfortable position in front of the mirror. You’ll need a red lip liner (Make Up Forever Aqua Lips are pretty good, comfortable and extra long lasting), a red lipstick, and (optional) a lip brush and a red lipgloss (I like the punch of Rimmel Apocalips Lip Lacquer in Big Bang… it’s so strongly pigmented it can even be worn on its own). Then go for the lipstick. Either straight from the bullet or with a lip brush, apply a thin coat of the red goodness, slowly and steadily. After that, blot with a tissue. If you want a matte effect, still with the tissue on your lips, pat on a bit of translucent powder… And you’re done. If you’re going for the full on creamy sheeny red pout, then apply another thin layer of lipstick. You can keep on blotting and layering more product until your lips fall off. For an extra punch of shine (#tip: it’s easier to pull it off if your hair is pulled up and away from your face ;)) just dab a little bit of lip gloss.